rate: 100Not good at all. Items were delivered very promptly and in good condition. Feels sturdy and kids love it! Update (31 Aug) Sent in a scooter cuz the front wheel is misaligned. It was returned with a note stating nothing is wrong. Poor safety standards for such a company. And can't change the star rating! Up till now, they can't resolve the issue. Buyers beware! Update 8 Sep Finally collected a new set. Tested in the shop and seems to be ok. Hopefully this can last. The lady at Westgate outlet was really helpful throughout though. Good price and great as a gift. ★WINNING★CAVALIER SERIES LUGGAGE . AWESOME . GOOD . DURABLE ABS EXTENDABLE SHELL . NICE . TRAVEL . 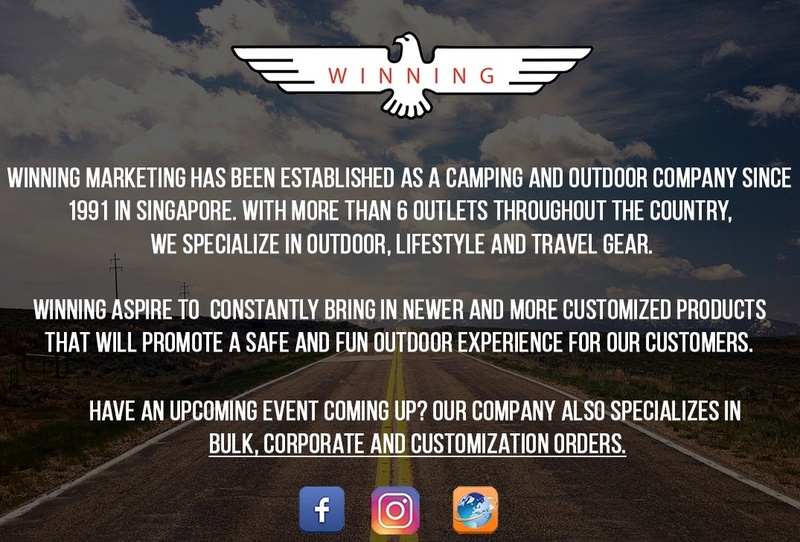 ★WINNING★ CHARM CAMPING BACKPACK (60L) . UNISEX . TRAVELING . COMFORTABLE . FREE RAIN COVER . ★WINNING★ ADULT SIZE BEAN BAG! HIGH QUALITY CANVAS TEARDROP DESIGN! MORE THAN 10 OVER DESIGNS!! ★CAMPING NEEDS★ MESS TIN x2/SOLID FUEL x8PCS/BURNER/STAINLESS STEEL MUG! CAMPING ESSENTIALS! ★WINNING★ High Back FOLDING CAMPING CHAIR AND STOOL! DURABLE AND PORTABLE DESIGN! ★WINNING★ OUTDOOR HIKING BACKPACK 50L (FRAME SYSTEM)! MULTIPLE COMPARTMENTS WITH FREE RAIN COVER! ★WINNING★ ANTI-SHOCK HIKING / TREKKING / WALKING POLES! LOCAL IN STOCKS! FAST DELIVERY! ★WINNING★ 219N 2/4/6 MEN WATERPROOF CAMPING TENT WITH INNER MOSQUITO NETTING!! FREE SHIPPING! ★WINNING★ MILITARY OUTDOOR RIPSTOP JUNGLE BOONIE HAT! COMES IN VARIOUS DESIGNS! ★WINNING★ Lightweight Foldable Automatic Umbrella! BEST BUY! Available in 3 colours. ★WINNING★ LUGGAGE ORGANIZER. TRAVEL POUCH/BAG/ACCESSORIES! LOCAL IN STOCKS! ★BEST SELLER 2016★ MEMORY FOAM/PREMIUM PLUSH NECK PILLOW! TRAVEL LUGGAGE ORGANIZER! ★WINNING★ Inflatable Travel Pillow. Local In Stocks! FAST DELIVERY! ★BHPC TSA LOCK AND KEY★ COMES IN 5 DIFFERENT COLOURS. FAST DELIVERY! LOCAL IN STOCKS! ★WINNING★ PREMIUM QUALITY Unisex Travel Multi-Purpose MESSENGER SLING BAG! ★WINNING★ 2 IN 1 USAGE TROLLEY BAG/BACKPACK. LAPTOP BAG. DURABLE+LIGHT!! SUITABLE FOR WORK/SCHOOL! BEST SELLER!! ★WINNING★ SPINE PROTECTION KIDS ERGONOMIC SCHOOL BAG! VARIOUS DESIGNS/COLORS! ★WINNING WINTER THERMAL PREMIUM WOOL THICK SOCKS★ MEN/WOMEN ABLE TO WITHSTAND UP TILL -15°! ★WINNING 3 in 1 DELUXE THERMAL WEAR(LYCRA+WOOL+COTTON)★ Local in-stocks! Fast Delivery! ★WINNING Heat-Up Thermal Wear★ WINTER LONG JOHN ABLE TO WITHSTAND FROM 3° AND ABOVE! ★WINNING DRI-GEAR★ SPORTS DRY FIT WEAR T-SHIRT. SOFT AND COMFORTABLE POLYESTER MATERIAL! ★WINNING Memory Foam Travel Pillow★ Giving you comfort as you travel ! FREE SHIPPING NOW!! ★WINNING★ BEST SELLER Lightweight Foldable UV WINDPROOF/WATERPROOF UMBRELLA! !